Canadian Citizenship is surely one of the best places for skilled workers and people who want to have a better quality life. There are ample opportunities of career growth for people with the right education, skills and work experience. The Canadian authorities want more number of skilled foreign workers who can contribute to the economic development of the country to come and settle in Canada. Skilled workers usually opt for permanent resident visa which gives them a number of benefits. But one major benefit that PR visa gives is that after a few years the permanent resident can apply for Canadian citizenship. Now citizenship is a big thing. There are a plethora of benefits that a Canadian citizen can enjoy. Canadian Citizenship opens more avenues for skilled workers. There are more number of jobs that they can apply for. Permanent residents cannot apply for jobs that involve security clearance and government jobs. But there are no such restrictions on foreigners who have the citizenship of Canada. If you want to have voting rights in Canada then you have to be a citizen of country. Only citizens can take part in active politics. Whether you have a permanent resident visa or any other visa you have to renew it before it expires. You cannot continue to stay in the country if you have not renewed your immigration document. But when you become a citizen you do not have to go through any renewal process. Permanent residents also keep worrying about loss of status. But citizens naturally do not have to worry about all these things. When you become the citizen of Canada you can apply for the Canadian passport. Now the passport of this country will obviously give you plenty of advantages and benefits that you may have not got with the passport of your birth country. The citizen of Canada will naturally enjoy other normal benefits like work, study and live anywhere in Canada, medical benefits and protection under the Canadian law etc. Take your first step towards Canadian citizenship! If you want to become the citizen of Canada then the first thing that you need to do is apply for the permanent resident visa for Canada. For this you will have to complete a number of formalities. It is better to approach reputed Visa consultants who can provide the best guidance. We at Kansas Overseas Careers have been providing visa and immigration services from past several years. We have one of the best teams of visa experts who are well versed with all the immigration formalities of Canada. 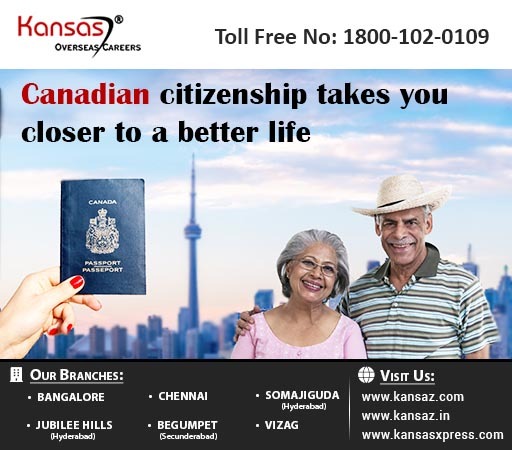 If you’re ultimate goal is to become a citizen of Canada then get in touch with us. Our experts will provide all the guidance and help that you need in realizing your dream. Walk-in to our branch and start your visa processing.